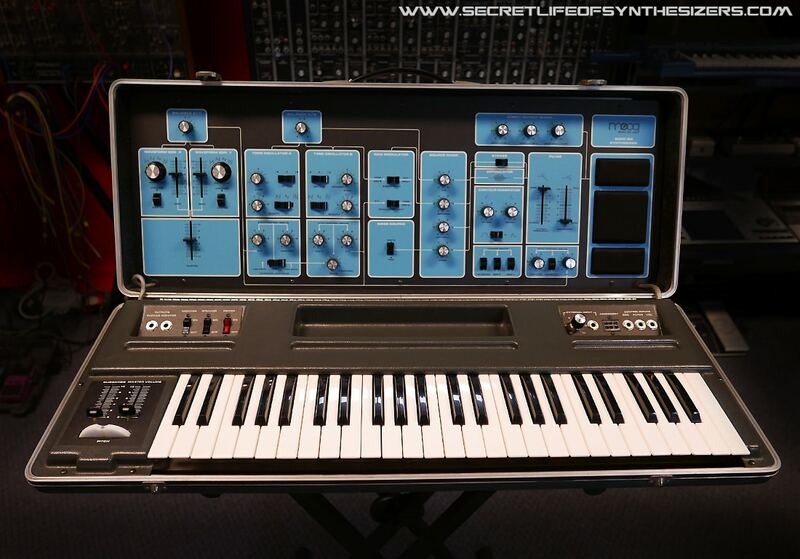 Throughout the 1970’s and 80’s, the golden age of synthesizer design, a few manufacturers stood out for their consistently high quality builds and their circuit design excellence and the Japanese companies led the world in many ways, their instruments were superbly engineered inside and out – high quality cases and circuit boards and excellent component selection that made for un-stressed electronics that is very reliable. Roland were and are famous for their synthesizers and other instruments and one of the most influential and recognisable of these was the TR-808 drum machine. It’s influence on modern music and culture in the 1980’s was profound to say the least. 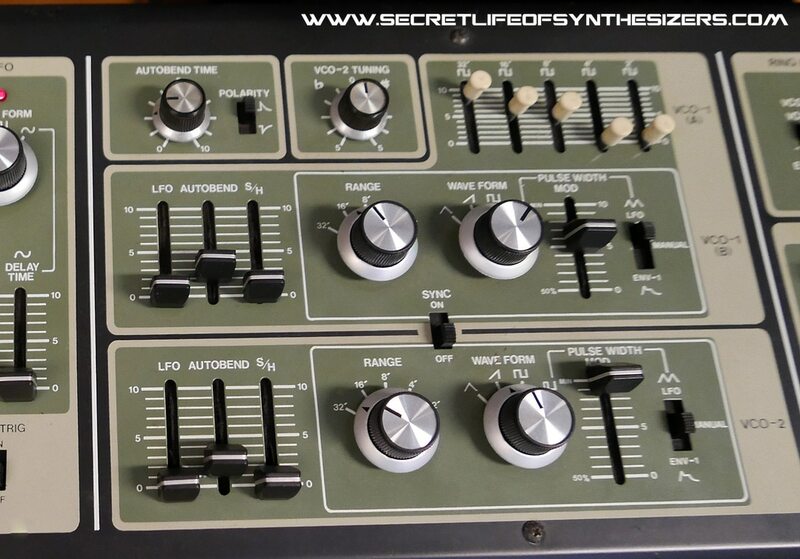 They are almost 40 years old now and they are very highly sought after, musicians love using them and they rarely come up for sale on the second hand market. The TR-808 has an interesting story and that is no surprise as it’s designer, Roland founder Ikutaro Kakehashi had a life journey that is almost unbelievable – His early life was a story of extraordinary creativity, resilience and sheer determination, he faced and triumphed over challenges that would make most people give up and fold. His story is worth reading as a lesson in indominable perseverence and strength of character. Mr Kakehashi was an excellent design engineer and he created Roland’s early products at the same time as building and running the company and travelling the world promoting it’s instruments. Solid state electronic components were quite new when he started Acetone and then Roland, by the early 1980’s component manufacturing processes were becoming quite mature but each batch of semiconductors such as IC’s and transistors had a significant reject rate, perhaps due to uneveness in substrate materials, temperature differences across dies and so on. Manufacturers tested each batch, graded the parts depending upon their electrical characteristics and marked them appropriately before shipping them out. From any given batch several different transistor part numbers might emerge depending upon how they performed. Some were so different than expected that they were rejected altogether and discarded. They may not be bad, they are still functional transistors for example but they just don’t fit the characteristics of any part number the company’s catalogue and so were dumped. And here begins a strange chapter in the story of the Roland TR-808 Rhythm Composer. 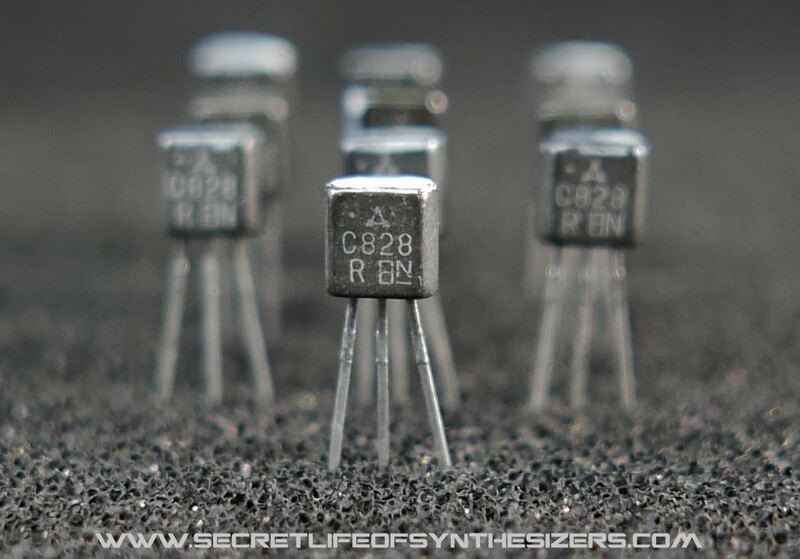 The image above shows some very special transistors. The part number on the front is that of a common transisitor, the 2SC828-R. Though discontinued these are still available to buy at many electronics suppliers for less that 30 cents each. 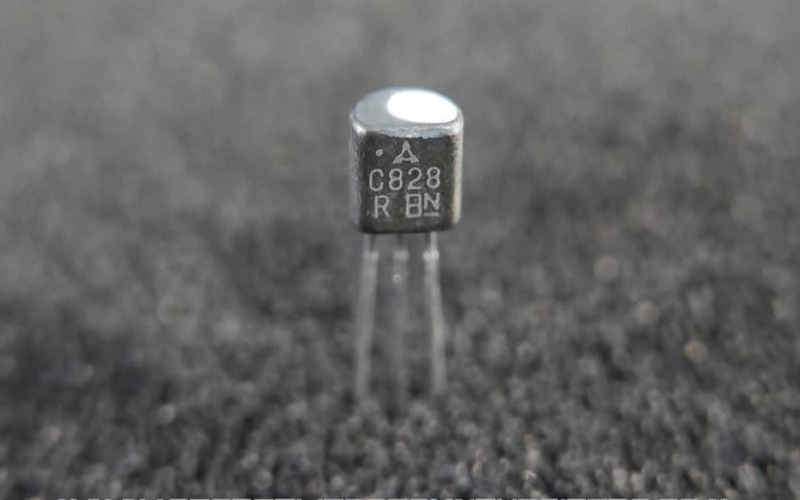 They are a simple, general purpose silicon NPN transistor used for audio and switching applications. The “R” suffix indicates the DC gain rating of the transistor. Several manufacturers made them including Toshiba and Panasonic. In a sense the numbers printed on the transistors in these particular photos aren’t technically correct, they are not actually 2SC828’s, they are basically a rejected transistor with a 2SC828-R part number still printed onto them from their production but that didn’t qualify as 2SC828’s during testing. 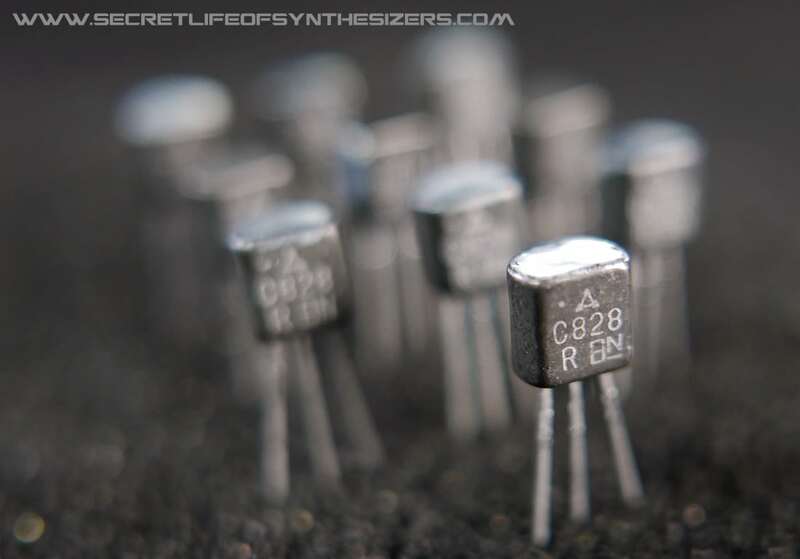 The transistors pictured in this article are some of the small batch of transistors that were rejected as “out of specification” by the manufacturer and purchased by Roland. The little patch of paint that you can see on the top of each transistor marks them as being very special and very, very rare indeed. The paint mark was applied at the Roland factory in the late 1970’s to identify these transistors as having a unique characteristic to be used as the noise source for Roland’s new drum machine, the TR-808 Rhythm Composer. How exactly Mr Kakehashi found these specific parts is not known, he would have had a relationship with the manufacturers that supplied parts to Acetone and Roland but you can hear him tell some of the story himself right at the end of the excellent 2015 documentary movie “808”. 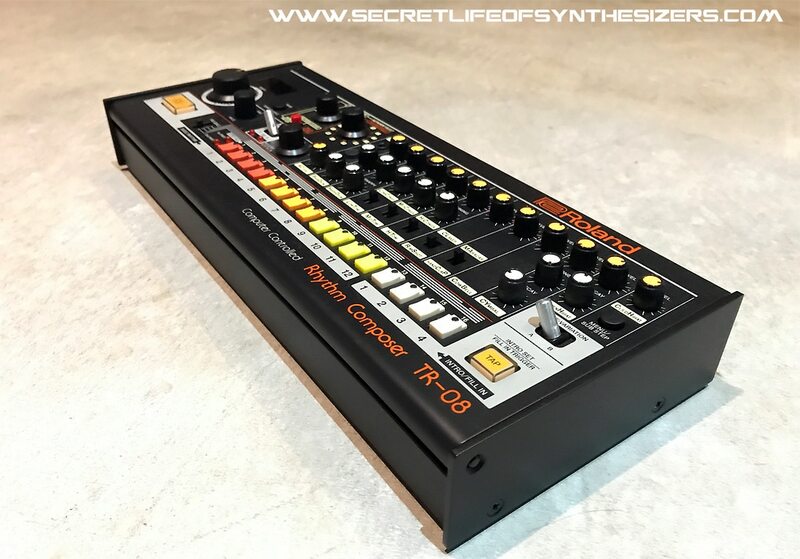 In the documentary he says that of a production run of 10,000 transistors for example maybe 2-3 percent were “defective” and he purchased these rejected parts which became intgregral to the “sizzling” sound in the TR-808. He said that as semiconductor manufacturing improved he found that he could no longer source these unique rejected parts. 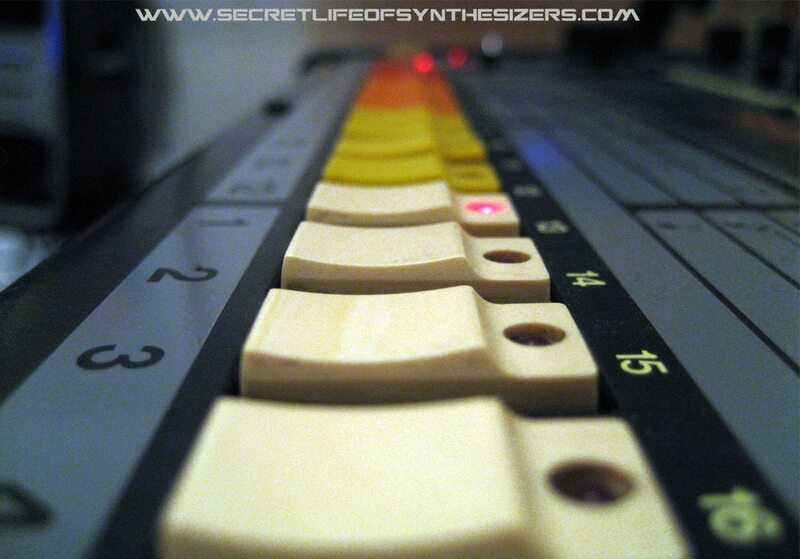 When he could not purchase any more of the transistors that was the end and the TR-808 could no longer be produced. That’s how important this transistor is to the TR-808’s unique sound. 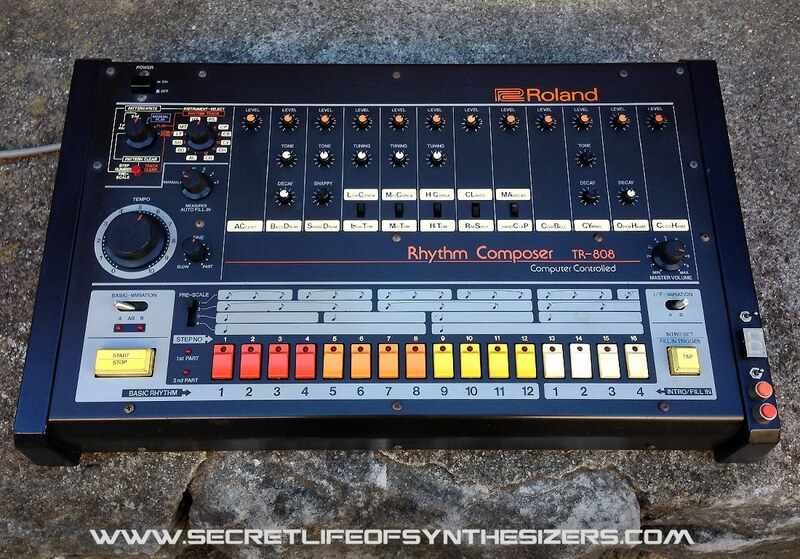 After a production run of 12,000 units the TR-808 was no more. There has been a lot of discussion about these transistors since the documentary came out and there is a lot of folklore around them so we thought that we would fill in some details and show you some close up photos of some of the few remaining transistors from the original lot. Click on the photos for a larger view. Can you clone the TR-808? It is not really possible (at least thus far) to build a perfect analogue copy of a Roland TR-808 without these transistors. Some clones have been released and some people have even attempted to build a DIY version using standard 2SC828’s and they discovered that it sounds very wrong. That’s because there is no other transistor or zener diode that has the exact noise spectral profile and output level of the 2SC828-RNZ transistors from the specific 1970’s batch that was used in the production of the TR-808. If the transistor fails in a TR-808 it must only be replaced with a transistor from that original batch or it will no longer sound like a healthy TR-808. When Roland ran out of them they had to discontinue production of the instrument because the noise characteristic of these transitors is crucial to the all important snare and hand clap sounds and that white noise is also then filtered into pink noise for other sounds in the instrument. If you put a standard 2SC828-R into a TR-808 in place of the noise selected part the sound completely changes. 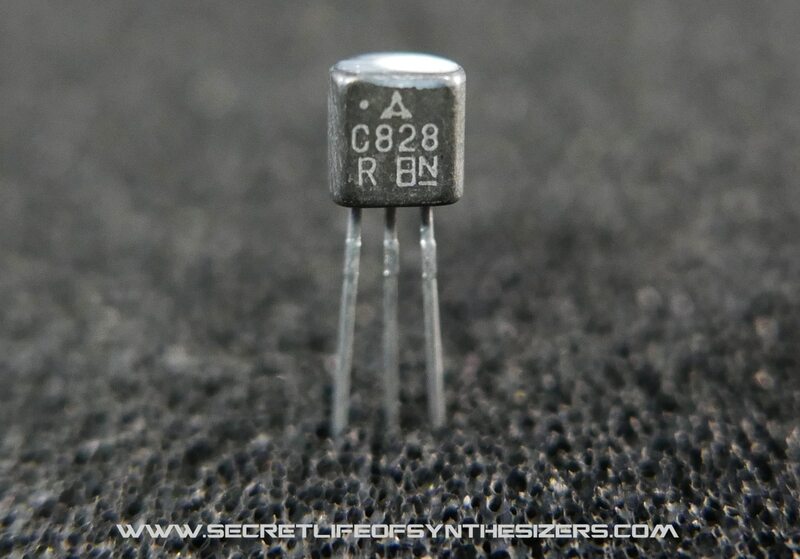 As mentioned earlier in the article these transistors are in fact not technically speaking 2SC828’s, if they were they would not have been rejected so putting a 2SC828 in place of Q35 is futile, it’s the wrong part. Fortunately the transistor is not prone to failing so if you own an original 808 then it’s not something you should worry about. Update and author’s note: Roland did eventually substitite two other noise transistor types into the TR-808 and we have tested both types since this article was posted. 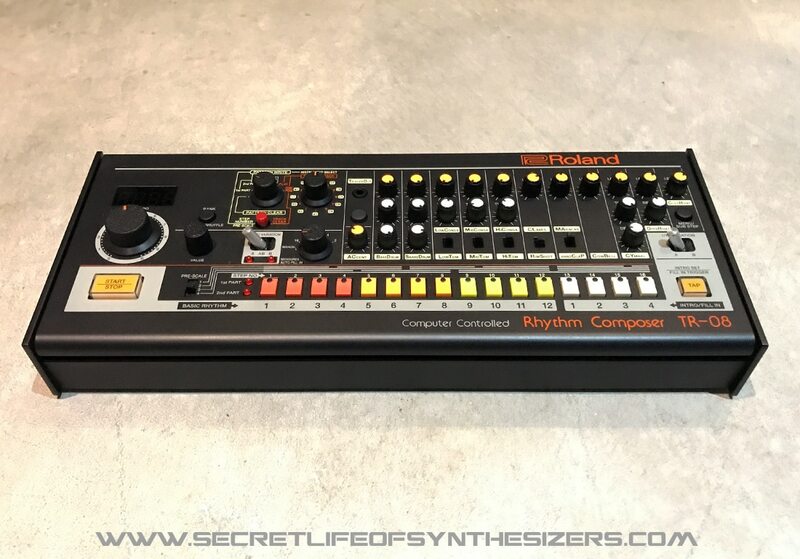 There is an alternative that Roland discovered that is close to the sound of the 2SC828-R NZ and that found it’s way into a few TR-808’s and other Roland drum machines. We will post the details in part 2. What is a “noise transistor” anyway? People familiar with analogue synths will know that they use noise generators along with their oscillators as tone sources. For wind and surf type sounds you go to your synth’s noise generator and use either “white” noise or “pink” noise depending on the sound that you need. The pink noise is usually white noise run through a filter and amplified. Your synth’s noise generator also provides a good source of random voltages for the sample-and-hold circuit. 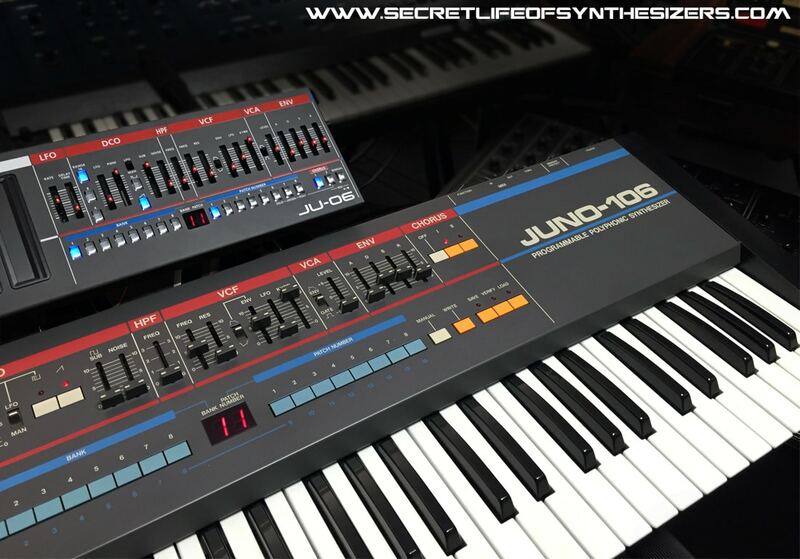 A few synths use a digital noise source but the vast majority used a quirk of semiconductor junctions that occurs when you reverse bias them into their breakdown region. If you connect a diode in reverse and limit the current while bringing up the voltage to the breakdown or “avalanche” region of the diode it produces tiny amounts of noise. A transistor’s base-emitter junction is even better, and if you look at the diagram from the TR-808 service manual below you can see that transistor Q35 only has two of it’s three terminals connected. That junction is the source for the TR-808’s white noise. The tiny and distinctive noise from the junction is amplified and distributed to the snare and hand claps and fed into a filter to provide pink noise for the toms. The tricky thing is that you can’t predict what the noise from any given model of transistor, diode or zener diode will sound like. It’s never pure white noise, every part type has it’s own spectrum and level and every type sounds different. Some synths use diodes, some use transistors. But in a drum machine the type of noise is really critical. The noise source is paramount in the TR-808 and TR-909 because it’s an integral part of the sound and it’s right up front in the sound of the drums, especially the snare drum. So the 808 and 909 had to have very precisely selected noise components. Not a problem in the TR-909, it used a shift register IC to generate quasi random white noise whereas the TR-808 is pure analogue and the transistors had to be carefully selected and matched, otherwise every 808 would have sounded different from each other, not at all a satisfactory state of affairs if every new TR-808 in a music shop sounded different from the others. 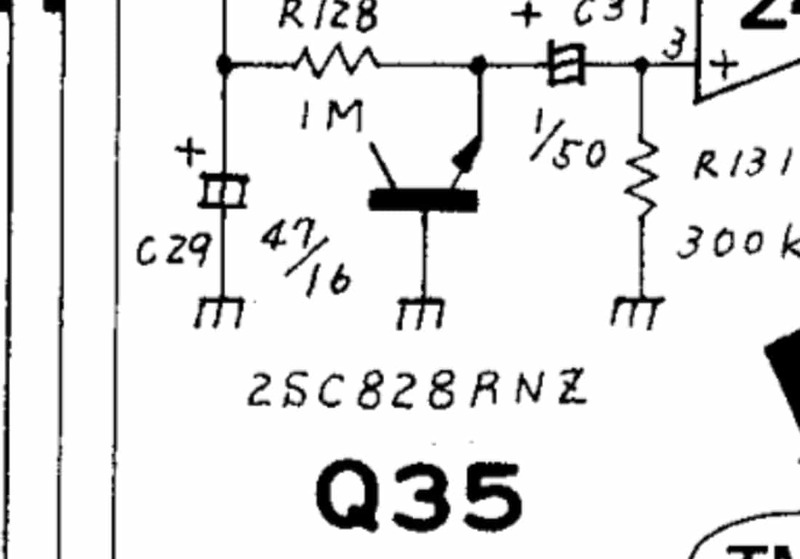 Q35 – the noise transistor. Schematic copyright Roland Corporation. While it’s difficult to produce a modern analogue copy of the TR-808 happily now there is a pretty decent alternative solution for musicians who want the sound and experience of the original and who can’t locate or afford one of these rare instruments. The unique noise fingerprint of the 2SC828-RNZ can be analysed and then precisely modelled digitally. We recently tried out Roland’s new TR-08 drum machine side by side with an original TR-808 and unsurprisingly the TR-08 sounded so close as to be within the margin of difference that you would find between a group of original TR-808’s. I say “unsurprising” because Roland engineers are extremely good at circuit modelling – They have pretty much perfected it with their Boutique series and no doubt the designers would have taken one of these original transistors right at the beginning of the project and measured and modelled the precise spectral signature of the original 2SC828-RNZ’s continuous noise output in the 808’s circuit configuration and then used that model as the noise source for the TR-08. In the end Roland itself came to the rescue of the next generation of TR-808 musicians. And don’t forget, if you have an original TR-808 or other TR-series drum machine, and especially a TB-303 or TR-606 the biggest killer of them is battery leakage. Mark your calendar and change them out regularly! Author’s note: Our opinion on the Roland TR-08 is our own, derived from testing it, we have no affiliation whatsoever with Roland. 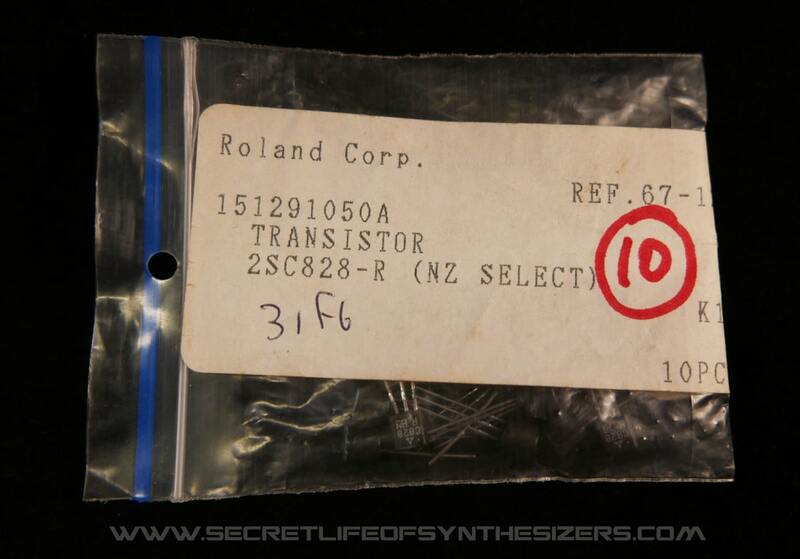 Update: We have published part two of this article and have done extensive testing of other transistors and there is in fact an alternative to the 2SC828-R NZ that Roland used in some TR-808’s and which are very close to the sound and output level of this transistor.